Today I'm sharing a fun customer's 1st birthday party for her son, Thomas. Having the party at an old fire station now turned museum for fallen firefighters was such a smart idea. With old firetrucks and other fire fighting memorabilia around, Jodi knew this would be the perfect place to celebrate little Thomas turning one. 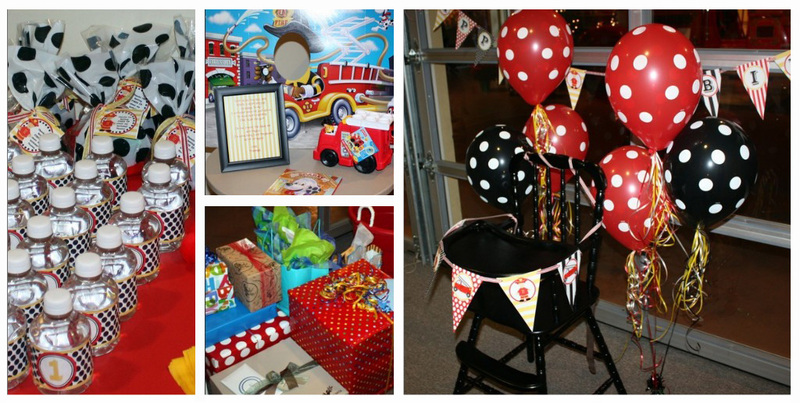 Jodi used Amanda's Parties To Go's Firetruck Party Printables to create a fun and festive fire station mood for the party. 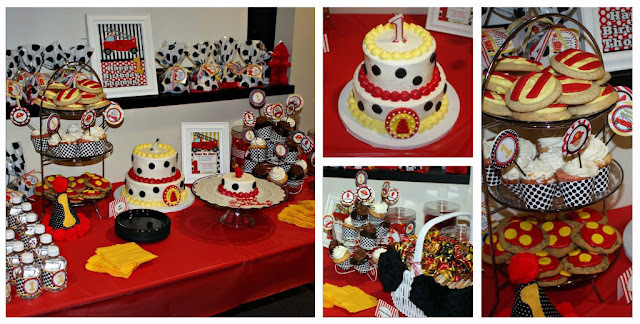 She says, "I used the printables to create a banner for his high chair as well as a happy birthday banner for behind the high chair. I wish I had a picture but I also used tall clear plastic containers to fill with candy. I wrapped large ribbon around and secured with the larger printable circles. I used the coordinating papers as backing for my monthly pictures of Thomas for a banner and these were also used on the table in small red plastic buckets filled with peppermints." Jodi also made Thomas' birthday hat and the tissue poms herself and had her husband and mom work together to find a vintage high chair and paint it black to tie in with the other party decor. 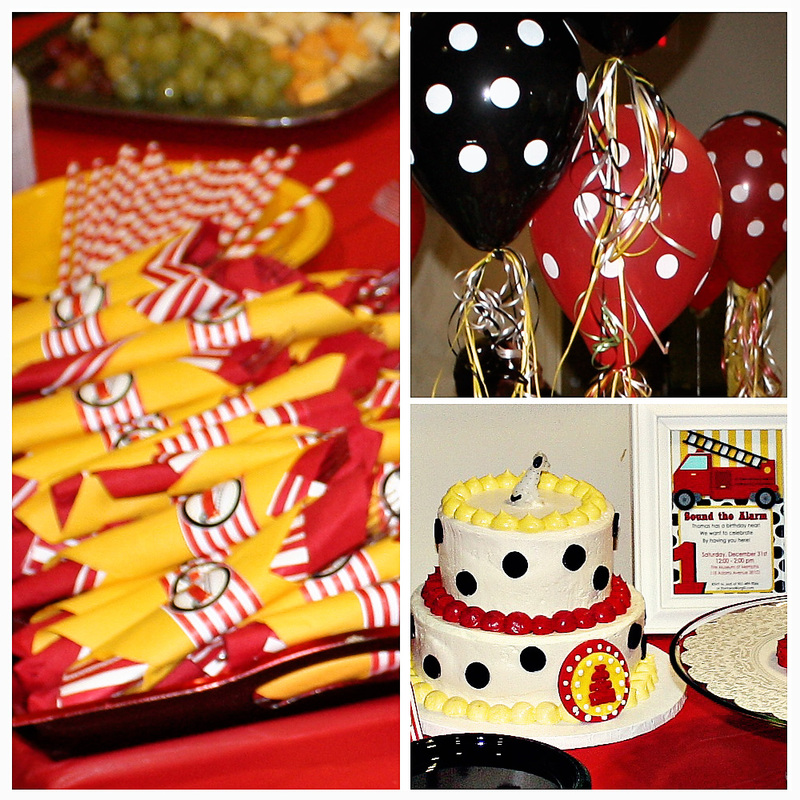 Jodi says, "We had chili (with all the fixings), hot dogs, fritos, and fruit for the food. We bought the most adorable old fashioned hot dog rollers. The hot sauce was in even fireman themed. For sweets in addition to the YoLo Bakes goodies, we had white chocolate covered pretzels, twizzlers, skittles, hot tamales and starburst…plenty of sugar! I used a combination of yellow, red and black for the paper goods. 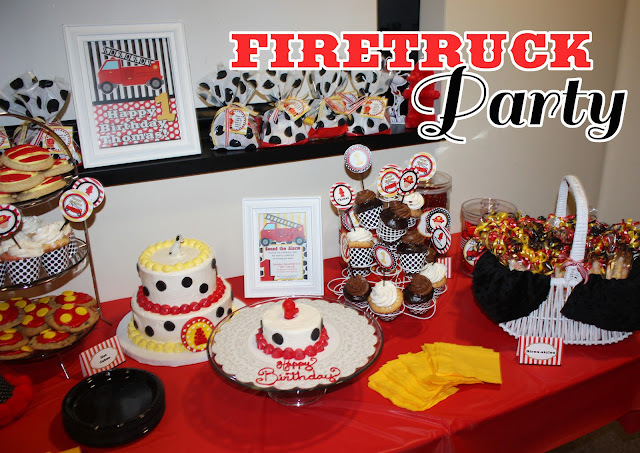 I wrapped the silverware in red/white striped napkins and yellow napkins and secured with the Firetruck printables napkin rings. 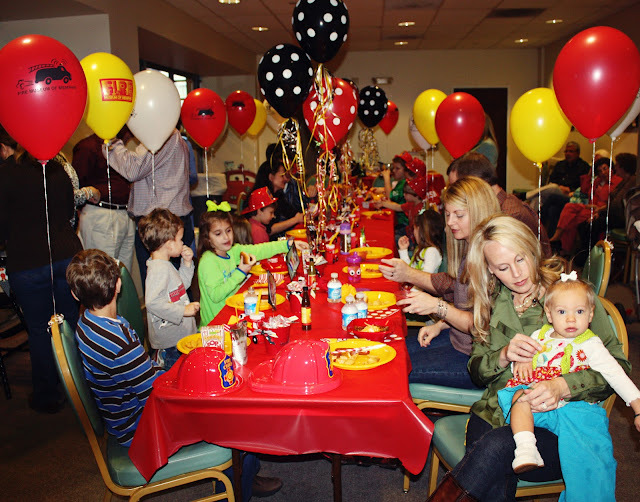 We had water bottles with the water bottle wrappers and also used black cups with the smaller printable circles as stickers on them with red and white striped paper straws." I set up a poem to instruct the guests to sign the Skippy the Fire Dog book when they arrived for Thomas to keep for years after. We also wrote what gifts he received in the back of the book. Behind the book we had a firetruck picture station where everyone could get their picture taken. 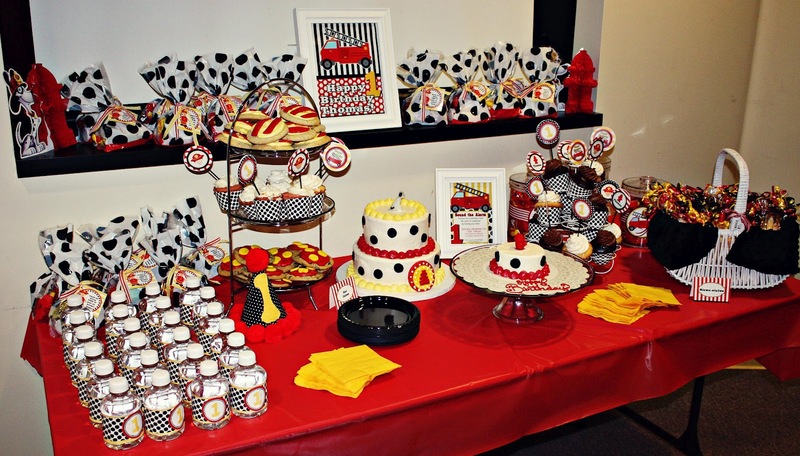 Each guest had an option to take home a fire chief hat, a fire truck sippy cup, a personal Museum balloon and a polka dot goody bag filled with fire truck temporary tattoos, fire truck whistles, a fire badge, and MORE candy." Thank you so much, Jodi, for sharing Thomas' party with us today. 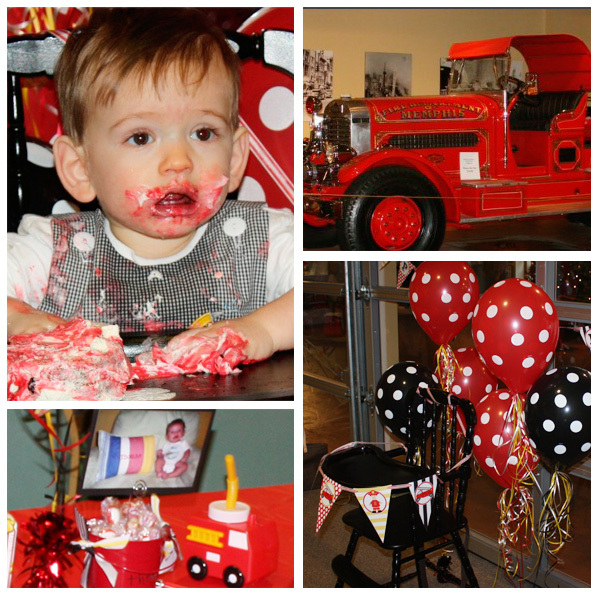 What fun firetruck party inspiration you've given us! I like the images. 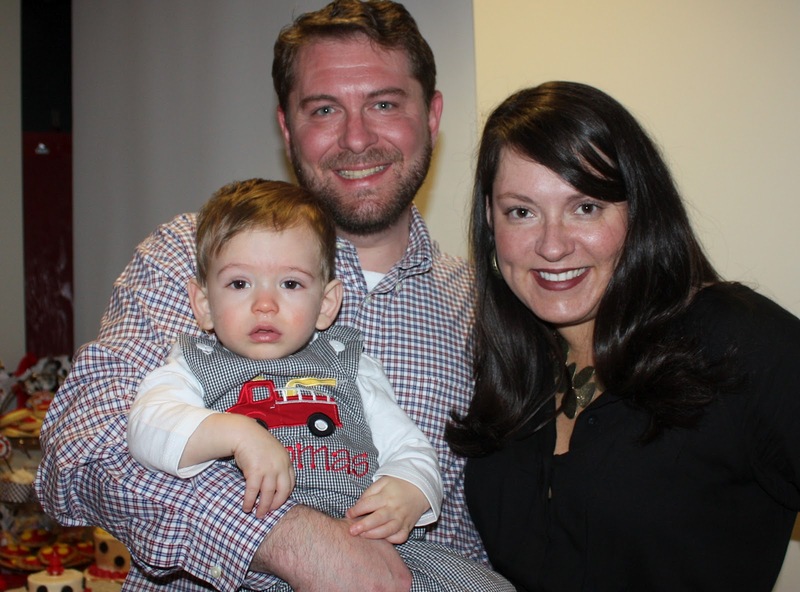 I have a 3 years old nephew who will love the party photos. your party looks like real fun with the 'cake face' picture being 'the ultimate'!